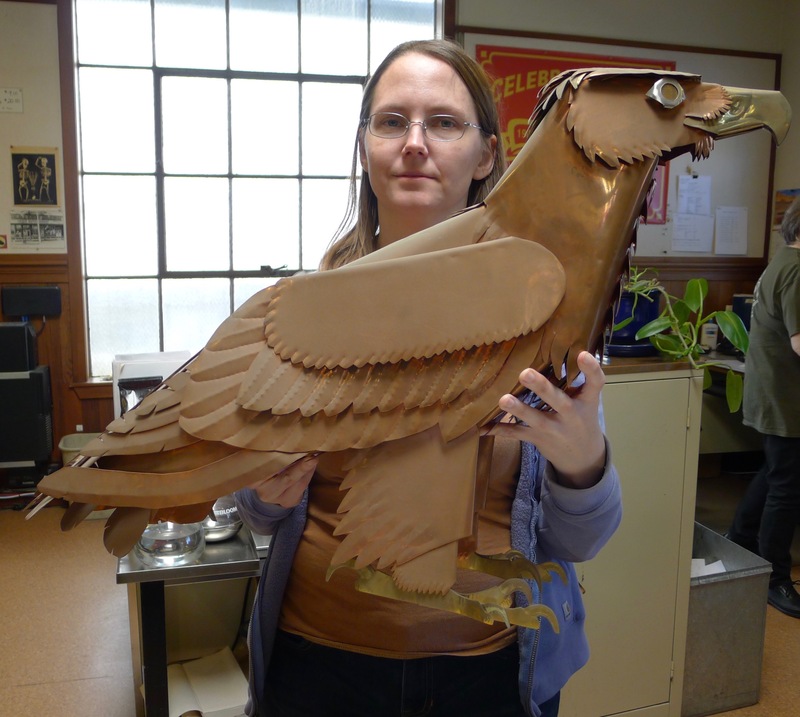 Melissa Mork made this mostly copper eagle. 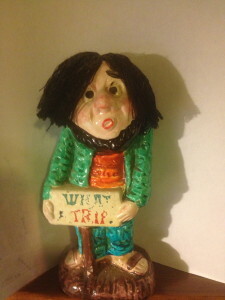 She is the daughter of Fred Mork who is the son of Walter Mork Jr. who was the son of Walter Mork Sr. Walter Sr. came to Berkeley after the 1906 San Francisco earthquake and in 1909 started the business that is today Walter Mork Co., heating, cooling, and sheet metal fabrication. Photograph courtesy of Walter Mork Inc.
Mork was a Finn, and an important player in Berkeley’s Finnish Community. Though only about 1% of Berkeley’s population in 1920, Finns played a highly visible and disproportionate role in the region’s commercial and cultural life. 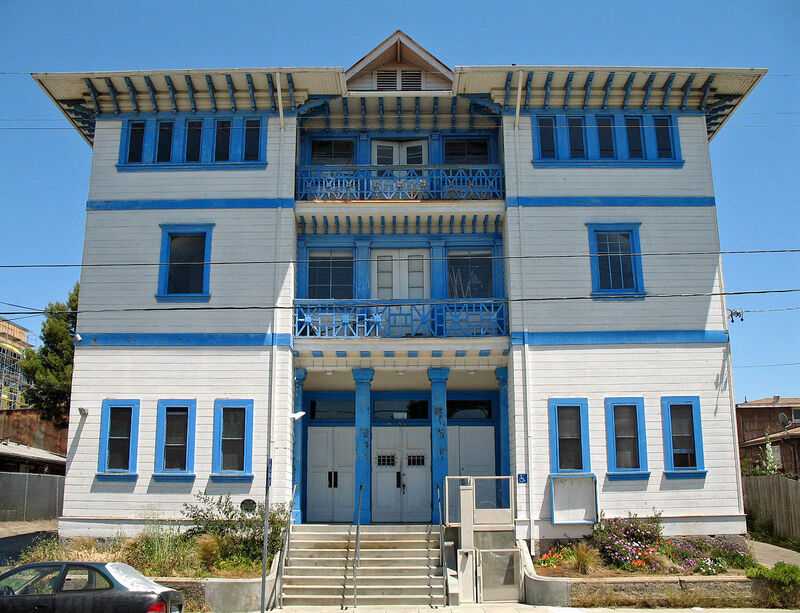 Radiating out from the intersection of University and San Pablo, Finntown encompassed several Lutheran churches, saloons, cooperative grocery stores, and the Finnish Hall on 10th Street, which was built by the radical Finnish Comrades Association and served as a community hub for all Berkeley residents after it was completed in 1909. Political divisions in the Finnish community, exacerbated by the 1917 Bolshevik Revolution in Russia that led to Finland’s independence, culminated in a second Finnish Hall (on Chestnut being built in the mid-1930s. Walter Mork played a role in both Finnish halls. 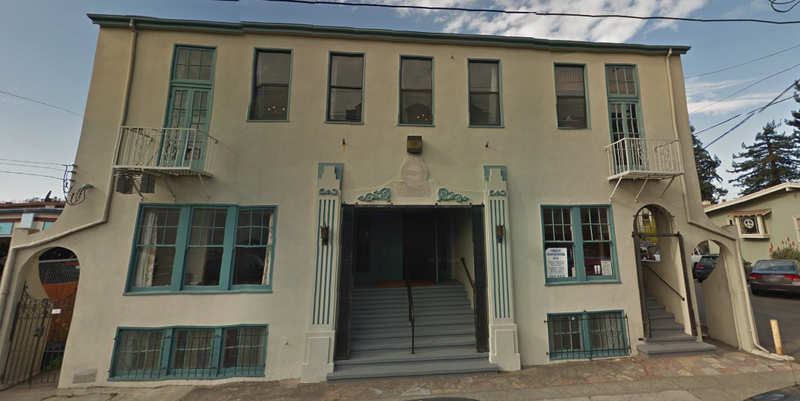 Mork was on the board of directors of the Finnish Comrades Association, which built the 10th Street hall. Two decades letter, he donated the land on Chestnut Street on which was named the United Finnish Kaleva Brothers and Sisters Lodge 21. 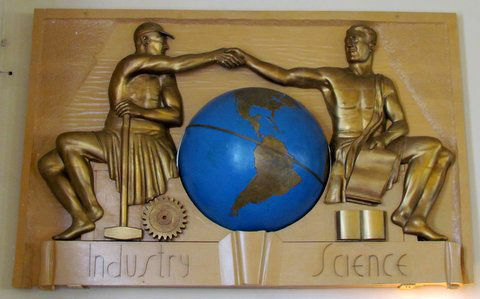 Melissa Mork remains involved with the Lodge; in 2013 she restored Oscar Linna’s sculpture “Industry and Sicence” created for the 1939 Worlds Fair on Treasure Island. 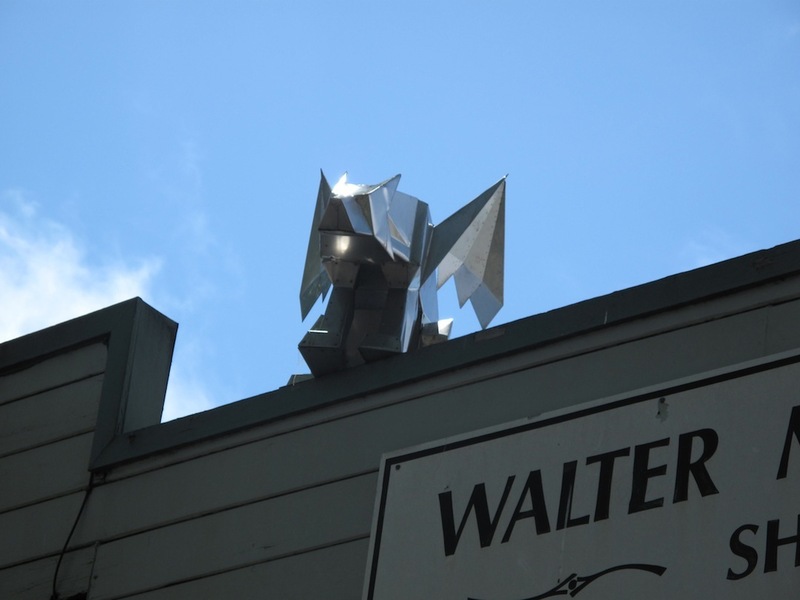 The sculpture moved between the two Finn halls, restored now on Chestnut Street. Four generations of the Mork family associated with the Finn halls – wonderful! Mahtava! 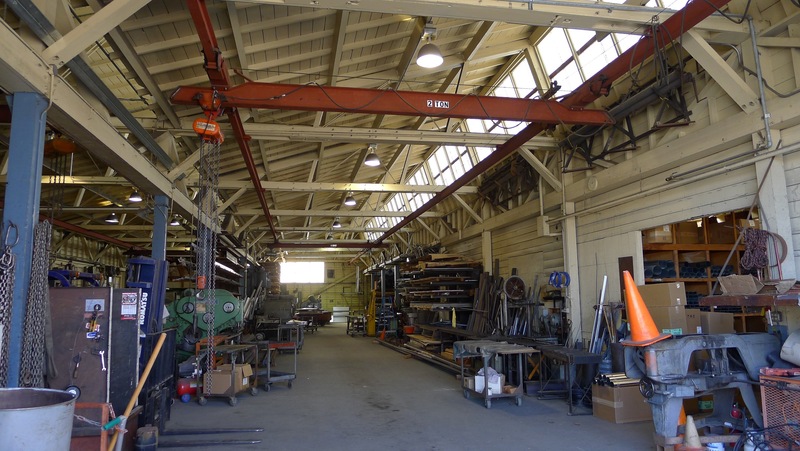 For more about Berkeley’s Finntown, see this website. Enough history – back to Mellssa. She grew up around the shop. Her father taught her about sheet metal, theory and skills. 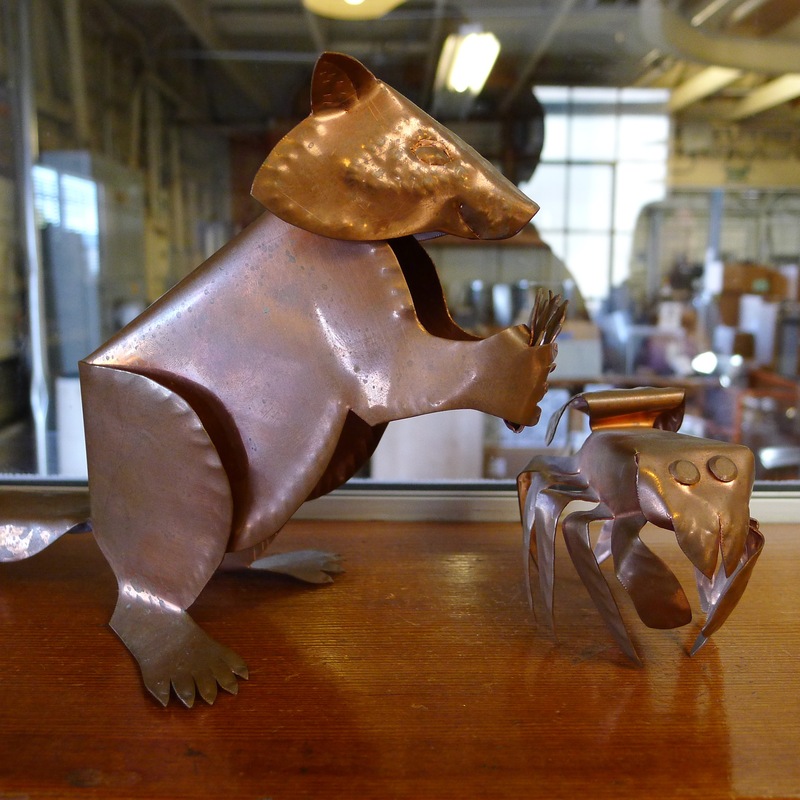 And then she took it away from HVAC and functional fabrication into art. 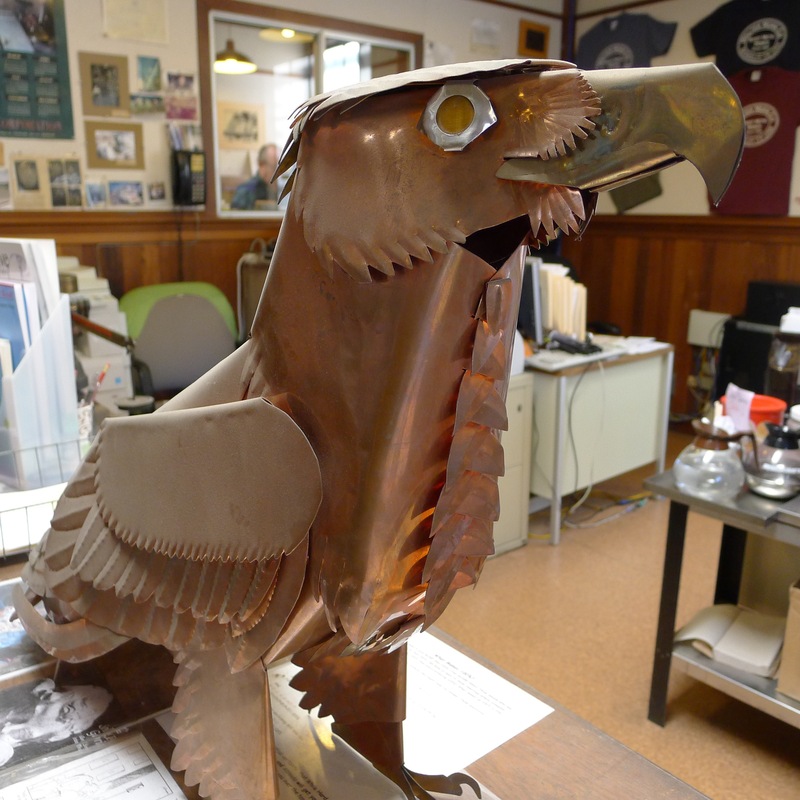 She has an extraordinary knack for sheet metal origami – visualizing a three-dimensional creature, translating it into a piece of sheet metal, and then – fabricating. On my earliest Quirky Berkeley tours, I stopped at Mork to see the grotesques. I wish that my mentor the late Archie Green were still alive for many reasons, including – I’d like to show him these and have him meet Melissa Mork. 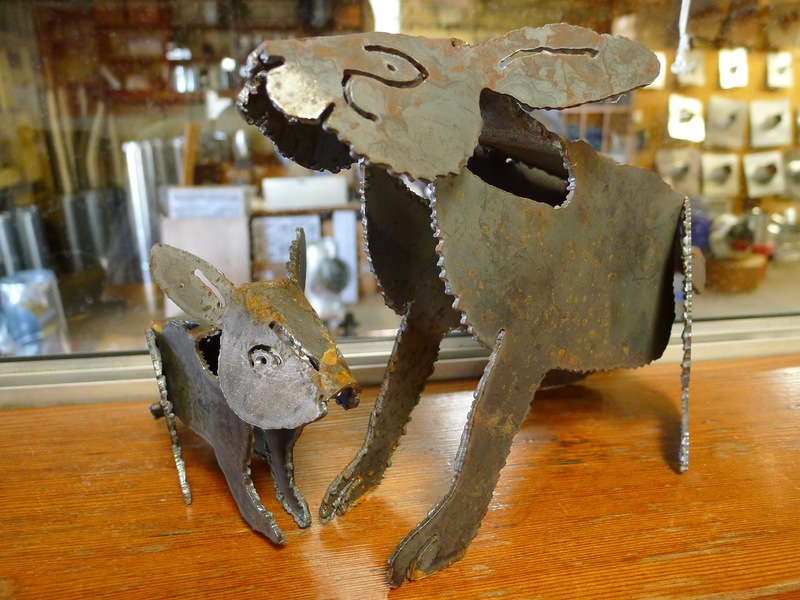 Tinsmiths and sheet metal workers have made tin men to serve as three-dimensional shop signs for centuries. Archie Green was a labor folklorist. 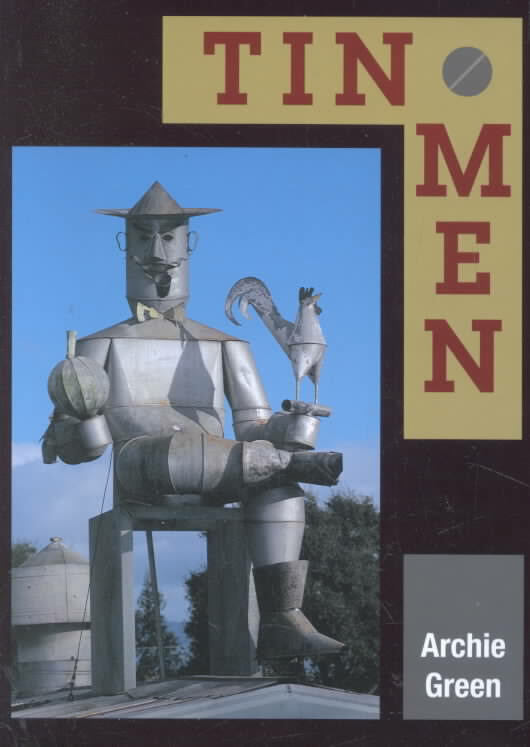 He studied tin men, and his Tin Men (University of Illinois Press, 2002) is a wonderful study of vernacular material culture. 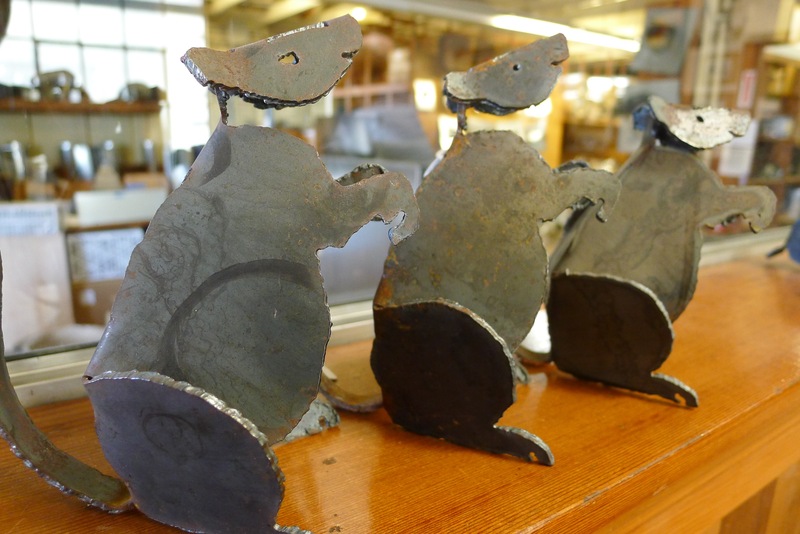 If you stand on the sidewalk and peer into the office, you can see more of Melissa Mork’s sheet metal fabrication sculptures. They are for sale. Reasonably priced. Wonderful. Two works in progress show how Mork starts flat and goes 3-D. I said, “Geckos!” WRONG. 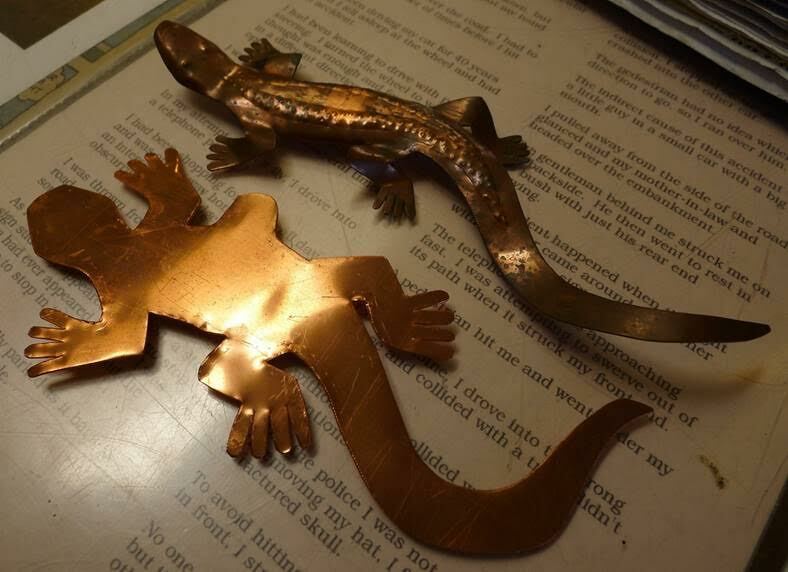 The flat piece is a gecko. The finished piece is a skink. Correction noted – there is a difference. 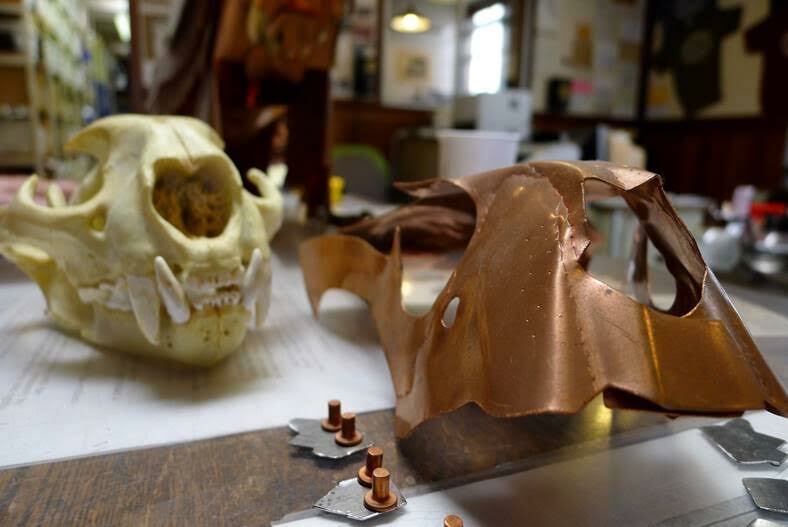 Using a cast skull, Mork here is shaping a bronze piece. The add-ons are easy to visualize. the main, big piece – not so much. 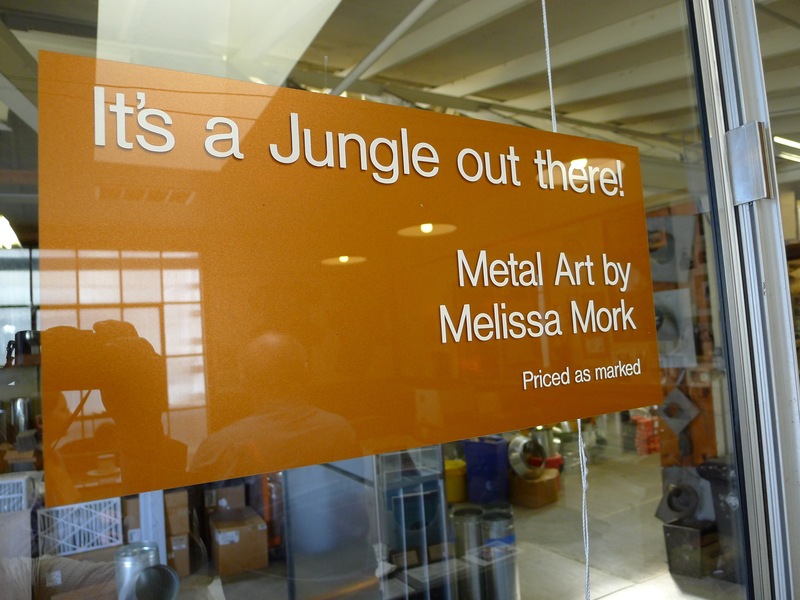 Quirky Berkeley recommends Melissa Mork’s Jungle. 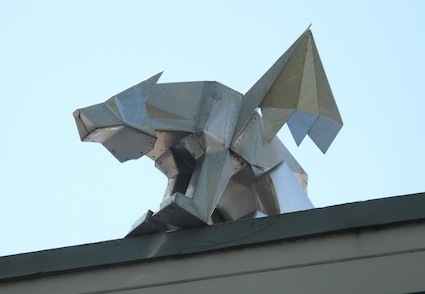 And as you drive on 6th Street just north of Dwight, check out the grotesques on the Mork Roof. Old school quirky! Okay. 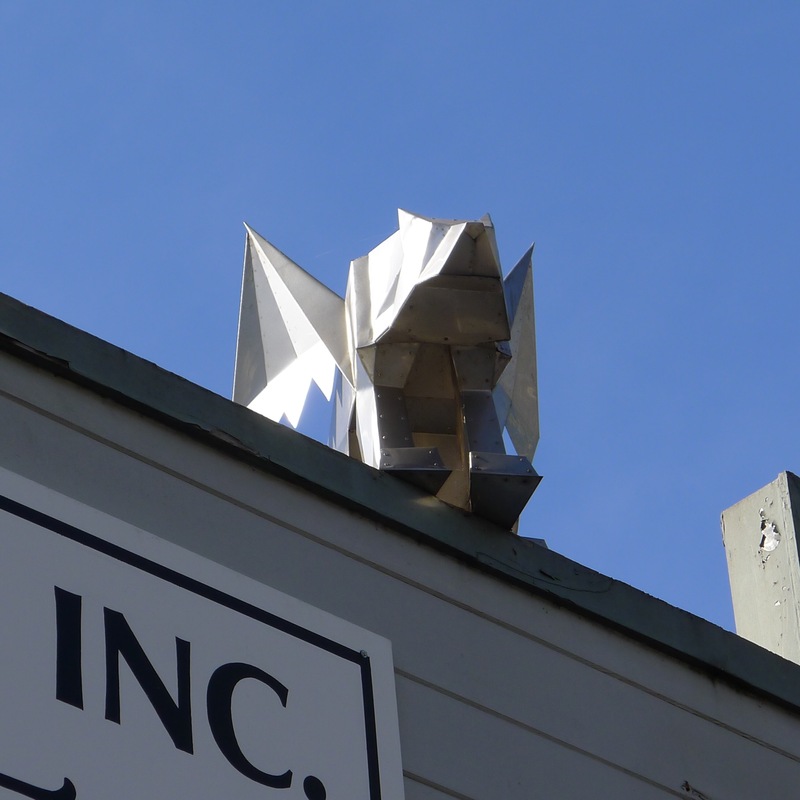 Digression aside, what about Mork’s lovely sheet metal origami? P.S. I don’t find any history of the Jefferson Airplane having played here. I haven’t done an exhaustive search though. 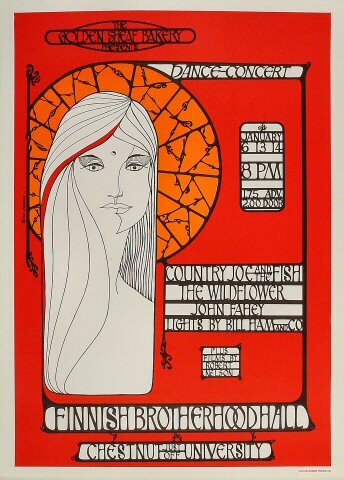 I did, however, find three concerts by Country Joe MacDonald there in 1966.